Reliable quantitative evaluation of molecular pathways is critical for both drug discovery and treatment monitoring. We have modified the CAM assay to quantitatively measure vascular density, endothelial proliferation, and changes in protein expression in response to anti-angiogenic and pro-angiogenic agents. This improved CAM assay can correlate changes in vascular density with changes seen on a molecular level. We expect that these described modifications will result in a single in vivo assay system, which will improve the ability to investigate molecular mechanisms underlying the angiogenic response. The application of antiangiogenic agents for cancer therapy may improve the results of conventional anticancer treatments because of increased tumor specificity and decreased development of tumor cell resistance [1, 2]. The correlation between increased angiogenesis and poor outcome has been established in breast cancer, renal cancer, prostate cancer, colon cancer and melanoma . Recent clinical trials have provided support for the use of antiangiogenic agents in oncology. Yang et al. have shown that single agent bevacizumab (anti-VEGF antibody, Avastin) can significantly prolong the time to progression of disease in patients with metastatic renal-cell cancer . In addition, Giantonio et al. have demonstrated the benefit of the combination of bevacizumab and chemotherapy as treatment for advanced colorectal cancer resulting in improved survival . The balance between angiogenesis and antiangiogenesis involves several mechanisms and pathways in addition to the modulation of VEGF. Identification and validation of these additional factors will provide new targets for antiangiogenic strategies . In order to capitalize on these discoveries, improved assay systems are needed to screen for novel angiogenesis inhibitors and to elucidate their mechanism of action. Angiogenesis is a complex process that involves an appropriate environment of growth factors, extracellular matrix proteins, proteases, and cell surface integrins to be present so that the cellular events of adhesion, proteolysis, migration, invasion and proliferation can occur . This interplay of host factors is critical for angiogenesis to proceed. Any quantitative assay system needs to recapitulate these components as closely as possible. A variety of in vitro and in vivo angiogenesis assay systems have been developed to measure the effect of various agents on endothelial cell proliferation and blood vessel growth . Many of these are subjective and qualitative with limited quantitative potential, and result in variable data from one laboratory to another. Most are based on isolated cell preparations, which do not adequately represent the complex host components and interactions that occur in vivo. Though in vivo small animal models are a closer approximation to the processes seen in humans, they can be time consuming and expensive especially during the early stages of agent evaluation and screening. 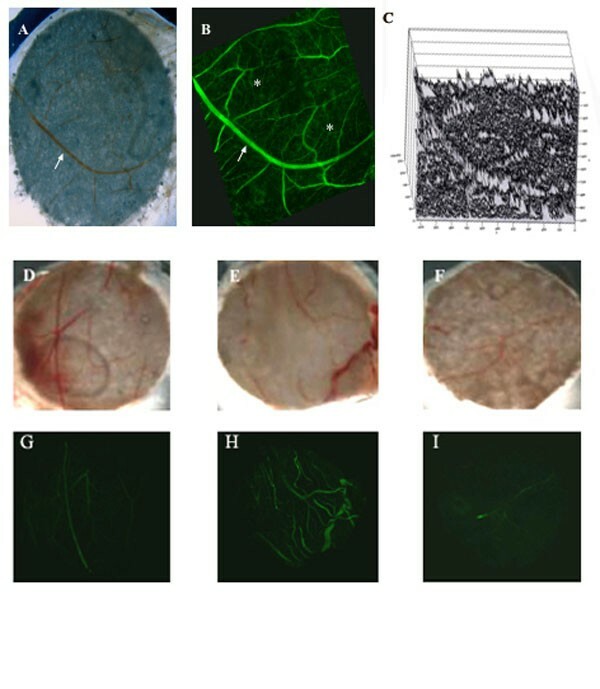 An alternative to small animal models is the chick chorioallantoic membrane (CAM) which provides a natural environment of growing blood vessels and all the components of the complex host interaction . However, its utility has been limited due to difficulty in measuring the angiogenic response to an experimental compound in an objective and quantifiable manner, and by the inability to identify the molecular basis for these changes. By utilizing novel methods to quantify vascular density and protein expression, we have adapted the CAM assay to create an in vivo angiogenesis model system that is rigorously quantitative, amenable to high-throughput screening, and applicable for the testing of systemic and/or topical administration of experimental agents. We have validated this assay with two known inhibitors of angiogenesis, known to modulate molecular proteins, and have then used the assay to identify and partially characterize a novel angiogenesis inhibitor. Chick embryos were acquired on embryonic day 10 from CBT Farms (Chestertown, Maryland) from White Leghorn chickens and incubated (RX2 Incubator, Lyon Electric, Chua Vista, California) at 98.6 degrees F and 51 % relative humidity. Small filter disks (Whatman filter paper #1001 090) were generated using a standard 6 mm hole puncher and sterilized by autoclaving. Two milliliters of Cortisone acetate solution (3 mg/ml in 95%ethanol; Sigma#C3130) was evenly pipetted as a thin layer over the filter disks until saturated and allowed to air-dry under a laminar flow hood. The CAM assay was performed in an identical fashion as described by Brooks et al. . Briefly, day 10 eggs were candled using a hand held egg candler at the blunt end of the egg to identify the air sac and prominent blood vessels. Using a Dremel model drill (Dremel #750 MiniMite), the CAM was separated from the shell by making a shallow burr hole at the blunt end on the egg and another burr hole made perpendicular to the previously identified blood vessels in the center of the egg. Mild suction was applied to the blunt end burr hole to displace the air sac and drop the CAM away from the shell. Fine forceps were then used to pick away the shell over the false air sac, so that a window could be made and the CAM identified. Next, 15 μl of recombinant human b-FGF(R&D Systems, #233-FB/CF) 2 ug/ml or vehicle (0.1%BSA/PBS) was pipetted onto a cortisone dried filter disk and the disk then placed on the CAM in an avascular area. The window was sealed with sterile Scotch tape and the egg returned to the incubator. At day 11, a small hole over the site of the previously identified blood vessels was made using a razor blade. The overlying shell was removed leaving the underlying white shell membrane intact. A drop of mineral oil was used to render the underlying blood vessels transparent. Using a 30-gauge needle, 100 μl of 100 μM fumagillin in 0.1% DMSO (Sigma-Aldrich, #F6771), 100 μl of 3 mg/ml LM609 (Chemicon Inc., Temecula, California), 100 μl of 0.1 μM CC5079 (Celgene Corp., Warren, New Jersey) or 100 μl of a carrier solution (0.1% DMSO) was injected into the blood vessel. Blood seepage was controlled with a cotton tip applicator, the window covered with sterile Scotch tape and the egg placed back into the incubator for 48 hours. At day 13, a second window was made on the opposite side of the egg from the original systemic injection site. A moderately sized blood vessel was identified and injected with FITC-dextrin 1 mg/ml (Cat#FD-2000S, Sigma) and placed back into the incubator for 30 minutes. The CAM disks were then harvested and placed into 10% formalin and stored at +4 degrees C. The CAM disk specimens were harvested for light photomicroscopy and then viewed under the Zeiss LSM 5 Pascal confocal fluorescent microscope using the FITC filter at 488 nm. The image was then analyzed by the Pascal imaging software (Version 2.8 SP1) so that the mean fluorescent vascular density could be measured. Images were then filtered to remove low level background and large parent vessel interference so that only new vessel blood formation pixel intensity could be measured. The CAM disks were harvested for light photomicroscopy and given to three blinded graders for scoring. Scoring was based from 0 – 4 (0 = no angiogenesis present in CAM, 4 = strong angiogenesis reaction in CAM). Results of three blinded graders for each group were then scored. Twenty-four hours after systemic injection of an inhibitor or carrier, day 12 eggs were removed from the incubator so that they could undergo a cell proliferation assay via a XTT cell proliferation assay kit (Roche Applied Science Cat#1465015). Five ml of XTT labeling reagent and 0.1 ml electron coupling reagent were mixed together and 30 μl applied via pipette onto the CAM disk. A small piece of sterile Scotch tape was reapplied over the central window and the eggs were returned to the incubator for 24 hours. At day 13 the disks were harvested for light photomicroscopy and the mean spectrophotometric absorbance at 450 nm was measured (reference wavelength 620 nm (Titertek Multiskan Ascent Plate Reader)). After systemic injection of the experimental compound or control vehicle, day 13 fertilized eggs were removed from the incubator. The CAM specimens were harvested, placed into 70% ethanol and stored at -80 degrees C. Layered Expression Scanning (LES) was performed on the CAM specimens according to 20/20 Gene Systems' protocols (20/20 Gene Systems, Gaithersburg, Maryland). After transfer, total protein bound to the membranes was biotinylated, followed by immuno-detection of the specific protein of interest. At the end of the assay, biotinylated total protein was visualized by streptavidin/FITC conjugate and specific protein/primary antibody complexes were visualized by appropriate secondary antibody conjugated to Cy3. Fluorescence on the membranes was detected on a Scan Array Express Microarray Scanner (Packard Biosciences) and measured by using ScanArray Express Software (Packard Biosciences). LES used the following antibodies: rabbit anti-MetAP-2 (Zymed Laboratories Inc., 1:100 dilution, Cat#71–7200), rabbit anti-p21 (Zymed Laboratories Inc., 1:100 dilution, Cat#71–1000), mouse anti-human integrin alpha v beta 3 (Chemicon Intl., 1:500 dilution, Cat# MAB1976B), and rabbit anti-caspase-3 (Cell Signaling Technology, 1:500 dilution, Cat# 9661). Protein/ primary antibody complexes were detected with appropriate secondary antibodies conjugated to Cy3 and analyzed on a Scan Array Express Microarray Scanner (Packard Biosciences). All statistical analyses were performed using InStat software (GraphPad Software Inc., San Diego, California) on a PowerBook G4 (Apple Computer Inc, Cupertino, California). Student's t test was performed when the standard deviations between groups were found to be equal. An Alternate Welch t test or nonparametric Mann-Whitney U test was performed when the standard deviations between groups were not equal. The CAM of the chicken embryo provides a unique model for investigating the process of new blood vessel formation and vessel responses to antiangiogenic agents. Prior studies using the CAM assay have used subjective scoring as a means to assess angiogenesis after administration of an antiangiogenic compound . In order to determine if the use of fluorescently labeled dextran together with confocal microscopy was superior to standard scoring systems, we compared the scoring of CAMs by confocal microscopy using image analysis software to the standard methods employed by blinded graders . CAM disks were treated with an angiogenic stimulant (bFGF) and placed onto the CAM surface. After systemic injection of fumagillin, a known antiangiogenic agent which inhibits endothelial cell growth , or a carrier solution, CAM disks were harvested and imaged using confocal microscopy after a second systemic injection of FITC-dextran into a vessel in the egg (Figure 1B). The images were then analyzed using image quantification software to calculate vascular density (Figure 1C). Each CAM disk was also photographed using light microscopy for standard blinded grading using an established scoring system . The results of these two methods were then compared. No difference was found among the three treatment groups when photographs (Figures 1D,1E and 1F) of the CAM disks were analyzed by blinded graders using a standard scoring system  (Figure 2A). This finding was due to the wide variability in the quality of the CAM disks when harvested which is a typical finding in these assays. Hemorrhage or debris can often obscure a large number of neovessels not visible under a dissecting microscope and these are therefore missed in the counting. The use of fluorescence and confocal microscopy allowed for better visualization of neovessels and an objective measurement of vascular density by imaging analysis software. Because the fluorescence allowed true neovessels to be better visualized, a significant difference was observed by fluorescent confocal microscopy between CAM disks treated with bFGF with a systemic carrier solution compared to unstimulated disks. A large decrease in mean fluorescent vascular density was detected between stimulated CAM disks and stimulated disks treated with systemic fumagillin (Figure 2B). The use of the confocal system and computer quantification of density, decreased the variability between measures seen with blinded grading and improved the sensitivity of vessel detection. It also allowed for an objective assessment of the changes in vascularity resulting from the administration of various modulators of angiogenesis. Fluorescent confocal microscopy imaging in the CAM. (A) Representative photomicrograph of a harvested CAM disk showing one large parent vessel (arrow) and a few tributaries. (B) Same CAM disk viewed under the Zeiss LSM 5 Pascal confocal fluorescent microscope using the FITC filter at 488 nm following an injection of FITC-dextran showing large parent vessel (arrow) as well as many additional branches (asterisks) not visible under photo microscopy. (C) Using a topogram of each fluorescent confocal image, pixel intensity was measured by the Pascal imaging software (Version 2.8 SP1). Images were filtered to remove low level background and large parent vessel interference so that only new blood vessel formation fluorescent vascular density was measured. (D-F) Day 10 eggs (N = 10–12 eggs per group) were divided into three groups and received filter disks saturated with vehicle (0.1% BSA/PBS) solution and systemic injection of carrier (0.1% DMSO) solution (D) or bFGF filter disks and systemic injection of carrier solution (E) or systemic fumagillin (F). Photomicrographs of CAM disks were given to three blinded graders (representative photomicrographs of one CAM disk from each treatment group shown) and scored for vascularization according to the standard 0–4 grading scale [7, 8]. (G-I) Same CAM disks as in D-F (above) after systemic injection with FITC-dextran. Evaluation of CAM photomicrographs by blinded grader evaluation. (A) Results of blinded grading evaluation showed no difference between the three groups tested. (B) Confocal fluorescent microscopy evaluation of CAM disks. CAM disks were scanned under the Zeiss LSM 5 Pascal confocal fluorescent microscope using the FITC filter at 488 nm. A significant difference was measured by mean fluorescent vascular density (+/- SEM) between unstimulated CAM disks and stimulated CAM disks after systemic injection of a carrier solution (P = 0.004, Student's t test) and between stimulated CAM disks which received systemic injection of fumagillin and carrier solution P = 0.015, Student's t test). We modified the XTT cell proliferation technique to directly measure endothelial cell proliferation in addition to changes in vascular density. Previous studies have used the XTT assay, a tetrazolium – based colorimetric system, to measure human umbilical vein endothelial cell (HUVEC) growth in association with anti-angiogenic compounds . The XTT assay is based on the cleavage of the yellow tetrazolium salt XTT to form an orange formazen dye by metabolic active cells and mitochondrial reduction of the XTT reagent in nonviable cells. We measured the amount of absorbance after the topical application of the XTT reagent onto the stimulated CAM disk. We were able to detect a significant difference between stimulated CAM disks (Figure 3A) and unstimulated disks (P = 0.028, Student T test). A significant decrease in mean absorbance was also seen in stimulated disks treated with fumagillin (P = 0.018, Student's t test) compared to untreated stimulated disks. There was a significant decrease in absorbance in stimulated CAM disks treated with LM609 (P = 0.029, Student's t test) and untreated stimulated disks. CAM XTT assay. (A) Day 10 eggs (n = 10 eggs per group) were divided into four groups and received filter disks saturated with a vehicle solution (0.1% BSA/PBS) and systemic injection of carrier solution (0.1% DMSO) or bFGF filter disks and systemic injection of carrier solution, fumagillin or LM609. CAM disks in all groups then received topical XTT reagent at Day 12. 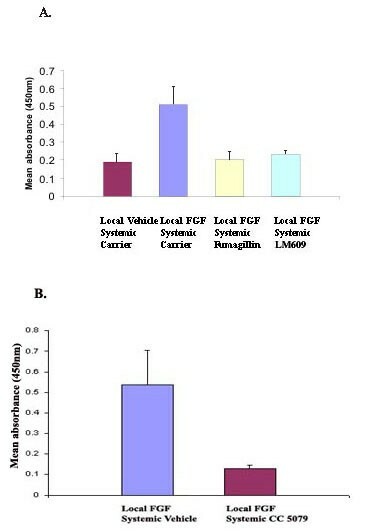 Significant differences were observed between stimulated CAM disks and unstimulated disks (P = 0.028, Student's T test) after systemic injection of carrier solution and stimulated disks and CAM disks treated with systemic injection of fumagillin (P = 0.018, Student's t test) and LM609 (P = 0.029, Student's t test). (B) Day 10 eggs were divided into two groups (n = 6 eggs per group) and received filter disks saturated with bFGF followed 24 hours later by systemic injection of carrier vehicle alone (0.1% DMSO) or carrier containing CC5079. On Day 12 both groups received topical XTT reagent. A significant inhibition of endothelial cell proliferation was seen as a result of the systemic delivery of CC5079 compared to control (P = 0.0079, Mann-Whitney U Test). Layered expression scanning is a new approach to comprehensively analyze tissue samples at the molecular level. This technique employs an array of layered capture membranes coupled to selected antibodies. A molecular profile is then obtained for a tissue type based on the antibody selected. We used LES to measure changes in the expression of proteins known to be involved in the mechanism of activity of two known inhibitors of angiogenesis (fumagillin and LM609) evaluated using the CAM assay. Following CAM disk treatment with bFGF, eggs were treated with systemic fumagillin or LM609, and the CAM samples were arrayed onto a glass slide (Figure 4A). Proteins were then transferred onto a 10-membrane LES stack (Figure 4B). Layered Expression Scanning (LES). (A) Ten disks (nine CAM specimens and one plain filter disk) were arrayed out on a glass slide. (B) A series of membranes (Multiblot membrane stack, 20/20 Gene Systems, Inc.) were generated and stained with polyclonal antibodies: rabbit anti-p21, rabbit anti-MetAP-2, mouse anti-human integrin alpha v beta 3, rabbit anti-Caspase-3. Images were scanned and analyzed on a Scan Array Express Microarray Scanner (Packard Biosciences). Images were corrected for total protein and loading correction. (C) LES/Fumagillin pathway. P21 staining was found to be greatest in CAM disks stimulated with bFGF and treated with systemic fumagillin. This was found to be highly significant when compared to stimulated CAM disks treated with systemic carrier solution (P < 0.0001 by Student's T test). 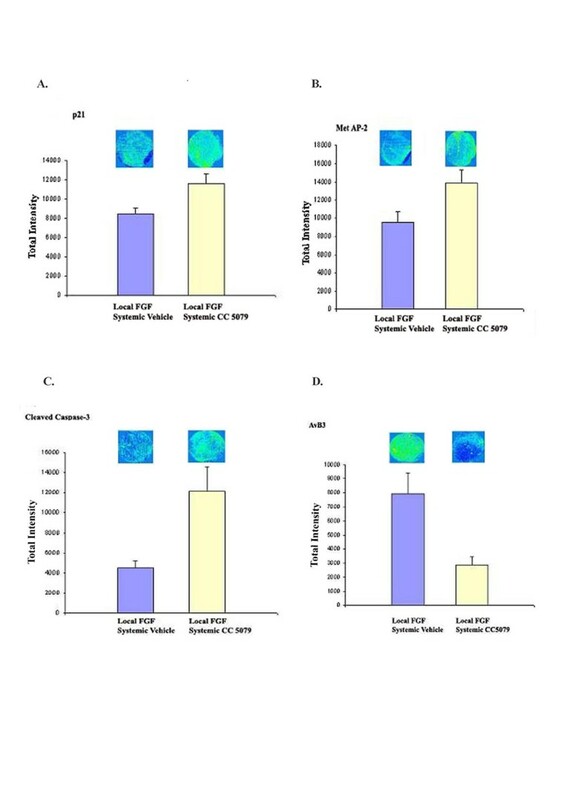 (D) MetAP-2 staining was strongest in CAM disks stimulated with bFGF and treated with systemic fumagillin (P = 0.0042, Alternate Welch t test) and systemic LM609 (P = 0.0253, Alternate Welch t test), compared to stimulated CAM disks treated with systemic carrier. We specifically probed the membranes for proteins known to be involved in the mechanism of action of fumagillin and LM609: p21, MetAP-2 and alpha v beta3. In addition, we probed the blots for proteins involved in the apoptotic cascade. Our results demonstrated that the amount of p21 was significantly increased (P < 0.0001, Student's t test) in CAM disks treated with fumagillin (Figure 4C). MetAP-2 was found to be significantly increased in CAM disks treated with fumagillin (P = 0.0042, Alternate Welch t test) and LM609 (P = 0.0253, Alternate Welch t test), Figure 4D). This data is consistent with the published literature, which has demonstrated that both p21 and MetAP-2 are increased in endothelial cells in response to fumagillin exposure [12, 13]. The amount of alpha v beta3 staining was greatest in stimulated CAM disks treated with bFGF. There was a significant decrease in the amount of alpha v beta3 in CAM disks after systemic treatment with fumagillin (P = 0.01, Student's T test). Treatment with LM609 did not significantly reduce the expression of alpha v beta 3 (P = 0.1376, Alternate Welch t test) although the values trended lower than control. Finally, there was a significant decrease in the amount of cleaved caspase 3 in CAM disks after systemic treatment with fumagillin (P = 0.007, Student's t test) and LM609 (P = 0.014, Student's t test, Figure 5B). This finding is consistent with previous data demonstrating a relationship between fumagillin treatment and inhibition of cleaved caspase-3 . LES/LM609 pathway. (A) Alpha v beta 3 staining was most intense in stimulated CAM disks. The difference in staining was found to be statistically significant between stimulated CAM disks and disks treated with fumagillin (P = 0.01, Student's t test). (B) Cleaved caspase-3 staining was found to be greatest in stimulated disks treated with carrier solution and least in CAM disks treated with fumagillin (P = 0.007, Student's t test) and LM609 (P = 0.014, Student's t test). Having validated this new method for quantifying endothelial cell proliferation in the CAM assay using two known angiogenesis inhibitors, we next utilized the XTT assay to evaluate a putative small molecule inhibitor of angiogenesis, CC5079. Work in our laboratory has demonstrated that CC5079 inhibits endothelial cell proliferation in vitro in a dose dependent manner (data not shown). In order to determine if CC5079 had antiangiogenic properties in vivo, we treated day 10 eggs containing bFGF stimulated disks with either systemic CC5079 (0.1 μM) or a control carrier vehicle (0.1% DMSO) 24 hours after disk placement. The XTT reagent was then applied topically to the disks 24 hours after systemic injection and the disks were scored for endothelial cell proliferation using a plate reader. Significant inhibition of endothelial proliferation was detected in vivo as a result of systemic delivery of CC5079 using this assay (Figure 3B). In order to study changes seen at the molecular level in response to CC5079, we utilized our previously validated LES technique. Eggs were prepared in the same fashion with bFGF stimulated disks and were then treated with systemic CC5079 (0.1 μM) or carrier vehicle (0.1% DMSO). Figure 6A,6B,6C,6D demonstrates the measured changes in protein expression resulting from CC5079 treatment. We found that CC5079 significantly upregulated the expression of p21 (P < 0.0001, Student's t test) and cleaved caspase 3 (P = 0.019, Alternate Welch t test) while inhibiting the expression of alpha v beta3 (P = 0.027, Alternate Welch t test). The effect on MetAP-2 was not significantly different from the vehicle alone. LES/ CC5079. (A) p21 was increased in CAM disks treated with systemic CC 5079 as compared to control (P < 0.0001, Student's t test). (B) MetAP-2 trended towards greater expression in CAM disks after systemic CC 5079 injection, but this did not reach statistical significance compared to control (P = 0.0787, Student's t test). (C) CC5079 increased the expression of cleaved caspase-3 (P = 0.0184, Alternate Welch t test) while (D) inhibiting the expression of alpha v beta 3 (P = 0.0266, Alternate Welch t test). As antiangiogenic agents begin to show activity in the clinic, there is increasing interest in angiogenesis inhibition as a viable means for treating cancer [4, 5]. In order to improve upon these successes, as well as to help guide the choice of therapeutic combinations, a better understanding of the mechanisms of action and relative degree of activity of these agents is important. Robust screening methods are needed which can help in the selection of compounds that look promising for further evaluation. Our modifications of the in vivo CAM assay may provide a useful tool for this purpose. The creation of a fluorescent angiogram of the CAM is a simple modification which renders the assay more quantitative in the analysis of vascular density than previously described . In this study, differences between treatment groups could be detected when CAM disks were scanned under fluorescent confocal microscopy (Figure 2B) and the images analyzed with image analysis software (LSM 5 Pascal Software, Version 2.8 SP1, Copyright Carl Zeiss 1986–2000). 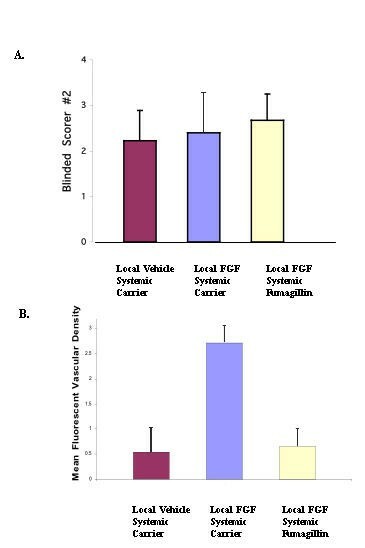 CAM disks stimulated with bFGF (Figure 1E and 1H) had a greater degree of angiogenesis than unstimulated disks (Figure 1D, and 1G) or disks that were stimulated but then treated with systemic injection of fumagillin (Figure 1F and 1I). These differences were missed by blinded graders (Figure 2A) using standard scoring systems due to the variability in vessel detection using this method. When comparing the light photomicrographs and FITC angiograms of stimulated CAM disks, it is apparent that many small blood vessels are not detected by standard microscopy (Figure 1A,1B). The use of fluorescent confocal imaging and FITC-dextran injection can render an obscure CAM disk readable and allows for the quantitative measurement of fluorescent vascular density. Of note, we have also used FITC labeled lectin in similar experiments with equivalent results (data not shown). In order to directly quantify changes in endothelial cell proliferation in vivo, we applied the XTT reagent to the CAM assay. The XTT assay is based on the cleavage of the yellow tetrazolium salt XTT to form an orange formazen dye by metabolically active cells. 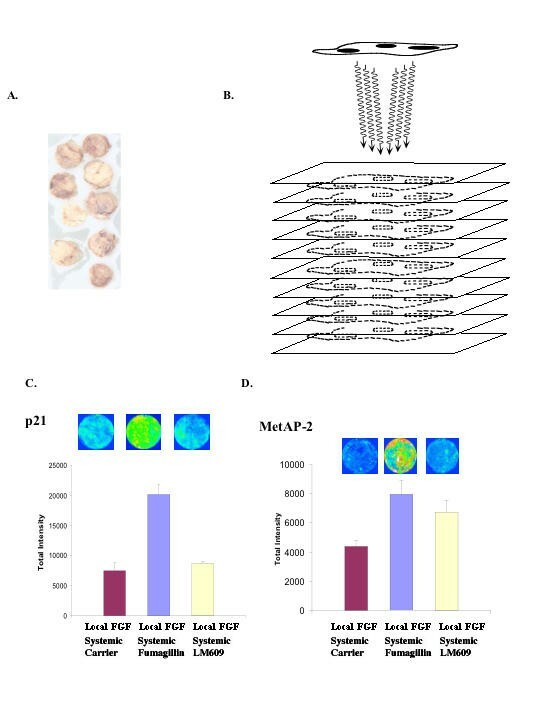 In our experiments, CAM disks treated with bFGF and the systemically administered angiogenesis inhibitors, fumagillin or LM609, showed significant inhibition of endothelial cell proliferation by the XTT assay as measured by a decrease in overall mean absorbance (Figure 3A). We also tested the putative angiogenesis inhibitor, CC5079, for activity using the XTT modified CAM assay. CC5079 is an orally bioavailable agent with in vitro effects on endothelial cells including inhibition of cytokine release, inhibition of proliferation, and inhibition of tubulin polymerization. CC5079 showed a significant decrease in mean absorbance in the XTT assay when compared to untreated bFGF stimulated CAM disks (Figure 3B). Use of the XTT assay may be a useful method to quantify endothelial cell proliferation or inhibition in the CAM assay in a more direct fashion. Such a measurement is complementary to the measurements obtained using the FITC-dextran angiograms which quantify vascular density and can be used to study vessel architecture and branching. In developing this new assay system we feel it was important not only to be able to quantify the phenotypic changes in angiogenesis, but also to detect proteonomic changes responsible for these effects. Layered Expression Scanning (LES) has been previously used to perform protein analysis and quantification in tumor samples [17, 18]. This technique is based on removing proteins from the tissue samples and presenting them to a thin absorbent membrane for detection and identification. The technique is similar to a Western Blot in that the proteins are more bioavailable to subsequent antibody analysis than they might otherwise be using approaches such as immunohistochemistry. In addition, LES allows for preservation of tissue architecture and for multiple blots to be created from a single sample. To validate this technique, we investigated a pathway previously determined to play a role in the mechanism of action of fumagillin. Fumagillin has been shown to modulate p21 and methionine peptidase (MetAP-2) [12, 13]. Changes in the levels of expression of p21 and MetAP-2 have been shown to correlate with the effects of fumagillin on endothelial cell proliferation [19, 20]. 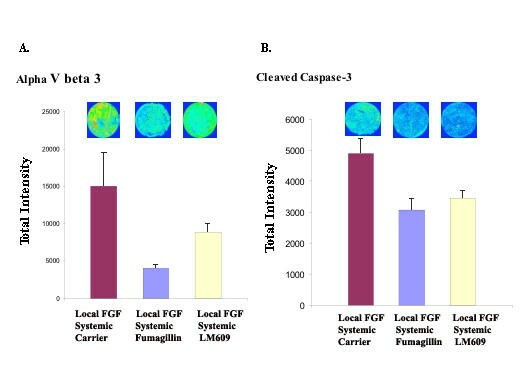 Our results demonstrated that p21 staining was greatest in CAM disks stimulated with bFGF and treated with systemic fumagillin when compared to controls (Figure 4C). Furthermore, MetAP-2 staining was greatest in CAM disks stimulated with bFGF and treated with systemic fumagillin. These findings are consistent with the published literature and help to validate this approach [12, 13]. We also found that there was an up regulation of MetAP-2 in disks treated with LM609 (Figure 4D). The accumulation of the G-1 cyclin-dependent kinase inhibitor p21 is known to be caused by the activation of the p53 pathway after exposure to TNP-470, a fumagillin analog . The exact mechanism for the increase in MetAP-2 by fumagillin is unknown, however previous studies have shown that MetAP-2 acts as a direct molecular target for TNP-470 . The up regulation of MetAP-2 in association with LM609 has not been previously described. There was a significant decrease in the amount of staining of alpha v beta 3 in CAM disks treated with fumagillin (Figure 5A). The mechanism of alpha v beta3 down regulation in CAM disks after systemic treated with fumagillin has not been previously described. Staining for cleaved caspase-3 was greatest in stimulated CAM disks treated with systemic carrier. A significantly lower amount of staining was seen in CAM disks treated with fumagillin and LM609 (Figure 5B). Both, fumagillin and LM609 are known to induce apoptosis. Methionine aminopeptidase (MetAP-2) is known to be the molecular target of fumagillin. Fumagillin has been shown to inhibit cancer cell proliferation and MetAP-2 may play a complex role in tumor cell progression. Previous studies have examined the expression and function of MetAP-2 in an in vitro model of human mesothelioma. Fumagillin was found to induce apoptosis due to early mitochondrial damage in malignant cells. Transfection of mesothelioma cells with MetAP-2 anti-sense oligonucleotide induced MetAP-2 inhibition and increased caspase activity and the caspase inhibitor, zVAD-fmk, preventing fumagillin-induced apoptosis . Therefore, MetAP-2 and caspase activity may be inversely related. We also analyzed the effects of the putative angiogenesis inhibitor CC5079 after systemic injection in the CAM assay on the above pathways. Our results demonstrated that p21 was significantly increased by treatment with CC5079 compared to control. There was no significant effect on MetAP-2 expression compared to controls, while CC5079 increased expression of cleaved caspase-3 and inhibited the expression of alpha v beta 3 (Figure 6A,6B,6C,6D). These results suggest a possible role of CC5079 as an inducer of endothelial cell apoptosis perhaps through a MetAP-2 independent pathway. Additional studies will now be pursued based on these leads to further characterize the activity and mechanism of action of CC5079. In conclusion, we have described a modified version of the CAM assay, which utilizes systemic injection of FITC-dextran to create a quantitative measurement of vascular density. In addition, XTT reagent can be utilized as a complementary method to quantitatively measure endothelial proliferation in the CAM after systemic or topical administration of an anti-angiogenic or pro-angiogenic agent. Finally, Layered Expression Scanning (LES) may be very useful as a method to quantitatively measure protein changes in response to anti-angiogenic and pro-angiogenic agents in the CAM assay and therefore help to correlate changes in vascular density with changes seen on a molecular level. It is our hope that these described modifications will result in a single in vivo assay system that will help investigators to better understand the molecular mechanisms underlying the angiogenic response following exposure to agents and may help in the identification of novel targets and the design of novel therapeutics. Walter J Miller and Steven K Libutti contributed equally to this work.